Awesome! I'm loving this thread. The lighting is all wrong... you probably used a point light, when you should've used a spherical volume light. I used a "PointLight3D". Haven't ever used Papervision3D before. My first model, a Gloster Meteor made in Wings3d, for the cockpit competition. The placeholder I was using before was seven white cubes stuck together. A was aiming for something similarly lo-fi, but this has come out more complicated than I expected. Edit: Yikes, I just exported this and loaded it, and it came out all smoothed. Is there anyway to get wings to export things directly as flat-shaded? Nice! I really like some of your modeling, but in honesty I'm not a huge fan of your style. Your heads and eyes are what always get to me. It's not like they're bad, I just don't really like the consistent "peanut" shape. I think if you added a little more variety to your heads (square chins, less rounded shape) then your design would be much more effective. The eyes have the same problem. The three white circles in all of your work just doesn't allow for as much variety and texture. The eyelids are also a problem for me. It just seems too cartoony imo. If that's what you're going for, that's fine, but I just think they could use improvement. Maybe if you got rid of the eyelids and just added eyebrows it would be less overwhelming and allow for more flexibility and expression. Sorry if I'm discouraging you. Again, I really like the rest of the model. Hey, that's a pretty awesome model! "Flatshadedness" is not a property of a model usually, unless each polygon has its own set of vertices. I don't know how you're exporting it or what you're exporting it into, but generally, to get the flat-shaded look, you need to use the face normals when you render. If you use the vertex normals, unless the faces are all separated, it will always look smooth. Wings was exporting everything (into .obj) with vertex normals, and I didn't want to have to mess around with the import tools and calculate all the face normals myself. But I found a menu option, "auto smooth" (! ), that you can use to get it to assign face normals to everything instead. That's awesome! What are you using for this? that looks really great, pishtaco; the colouring especially does it for me. Pyglet, so pretty much straight opengl. That screenshot is incredibly cool. It really has some depth in it. I really like the black shapes- it adds a lot of... pizazz? to the picture. That's great, loving the feel of that snapshot! Thanks, I really appreciate the feedback! I can understand you're not likeing the face, what looked good on paper didn't look quite as good in reality. Yet, I hope it will look more interesting once I've textured it. Defenitly gonna try to add some cheeks. The method I use, which is honestly probably worse but involves less work, is to (in Wings3d) select ALL edges in the object, and set their "Hardness" to "Hard". I think these are called "smoothing groups" in other 3d apps, and can let you make a model look more properly-shaded on a per-face basis than having a model completely smooth or completely flat. 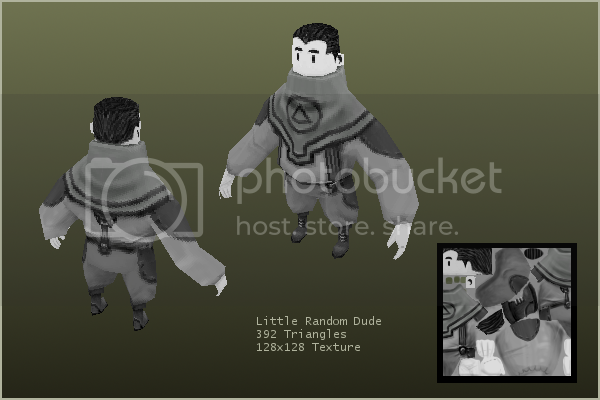 I think the main reason why I do this is because all of the Wings3d -> engine exporters I have used triangulate all the faces, such that if I turned flatshading on, it shades every quad (and more-vertexed polygons) as if it were a set of seperate triangles, which usually looks pretty terrible. Star Control 2, the player's ship? I love those flat shaded models! They remind me of those early 3d games like Star Fox on the Super Nintendo or Vortex or something. some one quick! make a flat shaded 3d game!